Wait, what's this? 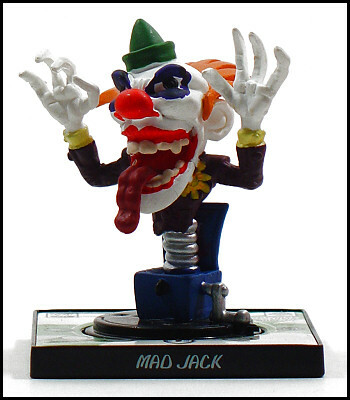 A new Creepy Freak that's not a repaint?!?!? Rejoice! Daisy here is a mutated Venus flytrap -- not unlike Audrey II of Little Shop of Horrors fame -- so while it's not a completely novel idea, the adaptation does work quite well for the Creepy Freaks line. 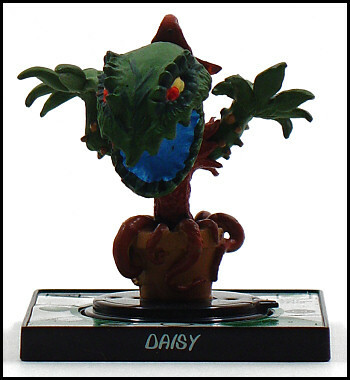 Also, whereas most versions of Audrey II (and most flytrap creatures in general) lack eyes and proper limbs, Daisy has both a set of peepers and branches with leaves that respectively resemble arms and fingers. This effectively makes her look almost like some sort of plant-dinosaur hybrid, which is kind of a neat idea that I'd like to see explored in fiction (or, even better, claymation film). Daisy's not quite as creepy or freaky as she could be with the proper characterization, but she's definitely one of the cooler Creepy Freaks. Also, given that Daisy was packaged differently in the box -- whereas most of the Creepy Freaks come in a sort of basket structure not unlike a squared cupcake holder, Daisy came in a front-facing plastic shroud fitted to her shape (think of upright sarcophagi lids and you're on the right track) -- I'm going to assume that she was one of the rarer figures. Also, given that it's sort of possible to tell whether a box has a figure like this in it by shaking it (her packing permits her to move far less and thereby make less noise), I can imagine kids sifting through the Creepy Freaks boxes and shaking them in attempts to discern which ones had the rarer figures with the oddball shapes. Konata would have, anyway! WOW, those actually look really cool! If you could get a few of those together, that would make a great display! Also, I like your stop-motion idea. Are these figs, by any chance, pose-able? All, anyone needs to do stop-motion these days is a digital camera, and something to animate. Get just a few of them together? I've got enough Creepy Freaks to cover an entire countertop -- or at least two TV dinner trays. 🙂 And alas, the Creepy Freaks are not poseable, though they can be clicked around on their bases in keeping with the HeroClix-esque gameplay. I kinda meant a few of "Daisy" all together. Especially if that's one that comes in different colors. And, it's a shame they're not poseable. They'd make excellent amateur youtube stop-motion characters if they were.